The houses of the little fishing-village of L’Estaque, near Marseille, are just visible below a rocky promontory framed by trees.Seascape. L’Estaque is one of Braque’s few truly Fauve paintings. It is remarkable for its arbitrary use of colour, with harmonies involving the whole colour range, and for its large areas of unpainted canvas. Although it has been compared to Matisse’s The joy of Life—on which it may have been based—Seascape. L’Estaque displays a greater interest in conveying depth through the construction of receding planes. 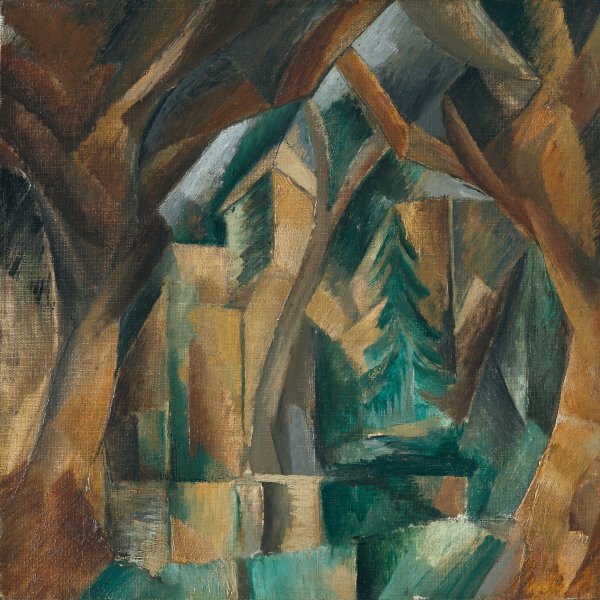 It should be remembered that Braque visited L’Estaque in the steps of Cézanne, whose influence led Braque—only a year later—to embark upon Cubism. Braque had met Matisse at the 1906 Salon des Indépendants. Matisse, who was deputy secretary of the Salon and member of the accrochage committee, was submitting Le Bonheur de vivre. 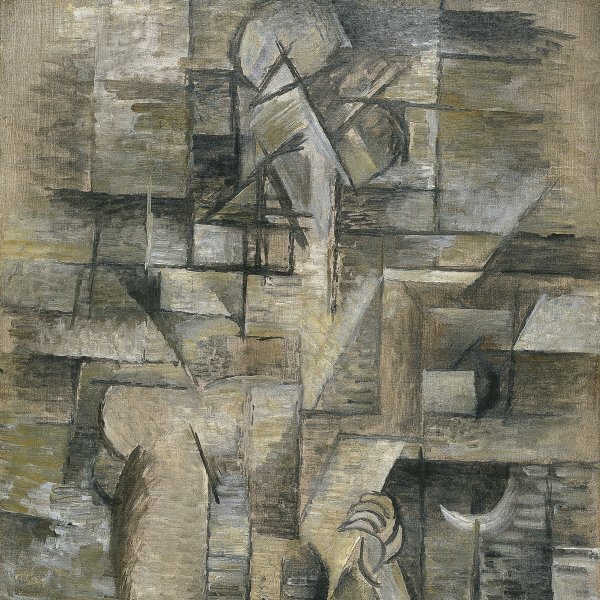 Braque presented seven paintings which he later destroyed. From then on he joined the fauves group. In May he showed two paintings in the first exhibition of the Cercle de l'art moderne, a group formed, among others, by Braque himself and by Friesz in Le Havre, the latter's native city. 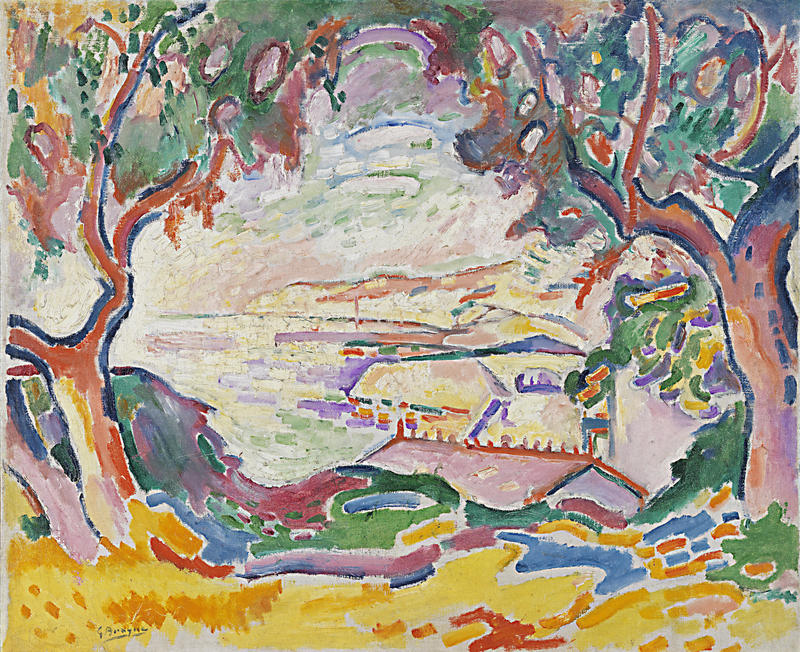 In June Friesz and Braque travelled to Antwerp, where they painted together a series of landscapes which, as far as Braque is concerned, can be considered the real beginning of his fauve period. In October Braque and Friesz went to L'Estaque, a small town with a fishing port near Marseilles, which had already been depicted by Cézanne in last decades of the 19th century. There they spent the autumn and the beginning of the winter of 1907. Seascape. L'Estaque is one of the pictures Braque executed during that stay. In its size and subject it can be related to L'Estaque Port, today in the Statens Museum for Kunst in Copenhagen. The stylistic comparison of these two paintings leads us to think that the one we are analysing must have been previous to the Copenhagen version. The trees framing the port view recall the composition of The Joy of Life. Actually, it is a compositional scheme typical of Claude Lorrain's landscapes, with masses of trees on the right and the left, framing, as if they were theatre backdrops, a distant scene with the horizon blurred by the bright light. None of the landscapes painted by Braque in L'Estaque shows this scheme as clearly as the picture we are analysing, and none of them is so close to Matisse's masterpiece in the colour choice and the lineal rhythm of the tree branches. Braque kept this painting for many years and it still belonged to him when it was included, with six others, in the special room reserved for the fauve painters in the Venice Biennale of 1950. The exhibition commissioners were Jean Cassou, Douglas Cooper, Georges Duthuit, Jean Leymarie, Roberto Longhi, C. L. Ragghianti, Arnold Rüdlinger, and Denis Sutton. In recent bibliography this painting appears with the title Landscape in L'Estaque. The title it has in this catalogue is that of the Biennale catalogue, the only time it was exhibited while Braque was alive.